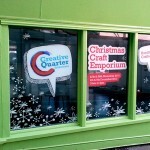 This Christmas, the Creative Foundation is going to use the site of the old amusement arcade at the harbour entrance to the Creative Quarter at the junction of Tontine Street and the Old High Street to hold a Christmas Craft Emporium with Father Christmas’ Grotto and we are looking for local craft makers, artists and food producers to come along and sell their products in the lead up to Christmas! The Emporium selling gifts, local produce, handmade goods, jewellery, textiles, mulled wine and more will be running over the next two weekends at 3-7 Tontine Street. The popular Santa’s Grotto returns, and will also based in the emporium (£1.00 per child).